The epicenter of an earthquake sends out waves which are like an object dropped on to a still body of water that sends out ripples. After the stone hits the water ripples move outwards from the centre in every direction. An earthquake releases energy as shock waves, the so-called seismic waves, which ripple across the earth's surface. The seismic waves created as they move from the epicentre an earthquake vary. What is amazing is how fast they can travel: up to 2 miles per second in granite! Seismic waves can be classified into two basic types: body waves which travel through the Earth and surface waves, which travel along the Earth's surface. Those waves that are the most destructive are the surface waves which generally have the strongest vibration. Body waves are of two types: compressional or primary (P) waves and shear or secondary (S) waves. P- and S- waves are called "body waves" because they can travel through the interior of a body such as the Earth's inner layers, from the focus of an earthquake to distant points on the surface. The Earth's molten core can only be traveled through by compressional waves. P-waves travel fastest, at speeds between 4-8 km/sec (14,000-28,000 km/h) in the Earth's crust. S-waves travel more slowly, usually at 2.5-4 km/sec (9,000-14,000 km/h). Sound waves are usually called P-waves and are heard but not often felt. Except in the most powerful earthquakes they generally do not cause much damage. P-waves shake the ground in the direction they are propagating, while S-waves shake perpendicularly or transverse to the direction of propagation (i.e. they displace material at right angles to their path). The P-wave is the first to arrive at a location, as it is the fastest. The P wave, or compressional wave, ultimately compresses and expands material in the same direction it is travelling. The next to arrive is the S wave which causes particles to oscillate. S waves can travel through solid material but not through liquid or gas. 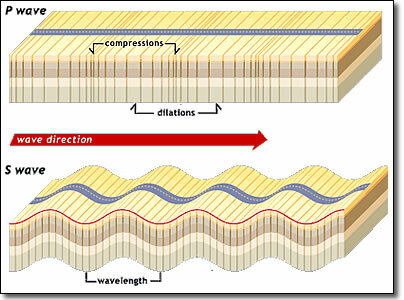 Surface waves, in contrast to body waves can only move along the surface. They arrive after the main P and S waves and are confined to the outer layers of the Earth. They cause the most surface destruction. 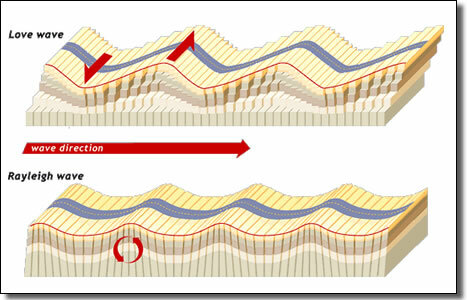 Earthquake surface waves are divided into two different categories: Love and Rayleigh. Love waves have a particle motion, which, like the S-wave, is transverse to the direction of propagation but with no vertical motion. Their side-to-side motion (like a snake wriggling) causes the ground to twist from side to side, that's why Love waves cause the most damage to structures. Rayleigh waves create a rolling, up and down motion with an elliptical and retrograde particle motion confined to the vertical plane in the direction of propagation. Surface waves are generally not generated by deep earthquakes. Particle motion for Rayleigh and Love waves are different: Rayleigh waves have retrograde particle motion confined to the vertical plane of motion, whereas Love waves have purely transverse motion in the horizontal plane. Earthquakes radiate seismic energy as both body and surface waves but deep earthquakes generally do not generate surface waves.